In the workbook that accompanies this page (available free of charge from the link at the bottom of the page), this range starts with Bin in cell C9. The f or frequencies column contains the ARRAY function =FREQUENCY(data,C10:C24), starting in cell D10 and finishing in cell D24. Remember, to array enter this FREQUENCY function and notice the range name data, the name I have given to the raw data. To create that FREQUENCY, array entered function, select the entire range D10:D24, type in =FREQUENCY(data_array,bins_array) and instead of just pressing Enter, press Ctrl+Shift+Enter on a Windows computer and cmd+Enter on a Mac … try it again if it doesn’t work the first time! That will give you the results in the f or frequencies column. 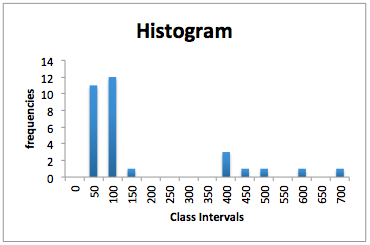 You should now have the rough and ready histogram I showed you at the start of this article. It’s fine isn’t it! =REPT Warning: big numbers are iffy! The =REPT function is fine until, for example, f = 100 or 1,000 then there are 100 and 1,000 letter n in a cell when we use REPT. 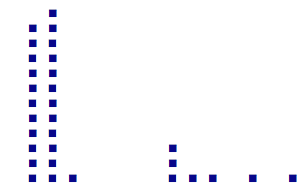 What we can do is to change the REPT function like this, if the results are large =REPT(“n”,D10/10) or =REPT(“n”,D10/100). Dividing D10 by 10 or 100 in this case shrinks 100 to 10 or 1 and it shrinks 1,000 to 100 or 10, when dividing by 10 and 100 respectively. 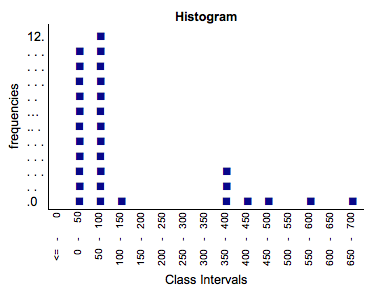 The =REPT Histogram Could Look Like That and Here’s How! Really? Did I use VBA? Voodo? No! I just used =REPT and a bit of jiggery pokery. Here is what I did. 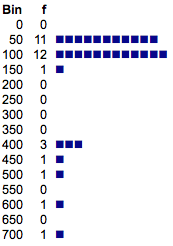 I prepared the original =REPT Histogram as you have seen. Now, that’s pretty good I think … I have never seen REPT made to do this before but that does not mean I think I invented it. It just means that I think few people have done it! =MAX(D10:D24)&”. . . . . . . . . . . . … .. . . . . . . . . . . . . .”&MIN(D10:D24) … this is a bit of a cheat I have to admit but, hey, it worked! I wrote this page for one very simple reason: this morning I woke up and thought about the REPT function and suddenly realised that using wrap text to turn a horizontal result into a vertical result might work. Having thought of that I knew I had to try it to see if I could create the histogram you now see here. More than that, the number of techniques I have used in this apparently simple exercise is relatively large. Not massive and not advanced but it should prove to be a good exercise for an Excel beginner/lower intermediate! 1st December 2013 … the first in advent so wherever you are, merry Christmas 2013!